Today we're going to focus on collecting Twitter data using their API using Python. You can use another language to collect data but Python makes it rather straightforward without having to know many other details about the API. The way that researchers and other people who want to get large publically available Twitter datasets is through their API. API stands for Application Programming Interface and many services that want to start a developer community around their product usually releases one. Facebook has an API that is somewhat restrictive, while Klout has an API to let you automatically look up Klout scores and all their different facets. The Twitter API has two different flavors: RESTful and Streaming. The RESTful API is useful for getting things like lists of followers and those who follow a particular user, and is what most Twitter clients are built off of. We are not going to deal with the RESTful API right now, but you can find more information on it here: https://dev.twitter.com/docs/api. Right now we are going to focus on the Streaming API (more info here: https://dev.twitter.com/docs/streaming-api). The Streaming API works by making a request for a specific type of data — filtered by keyword, user, geographic area, or a random sample — and then keeping the connection open as long as there are no errors in the connection. Let’s move our focus now to the actual elements of the tweet. Most of the keys, that is, the words on the left of the colon, are self-explanatory. The most important ones are “text”, “entities”, and “user”. “Text” is the text of the tweet, “entities” are the user mentions, hashtags, and links used in the tweet, separated out for easy access. “User” contains a lot of information on the user, from URL of their profile image to the date they joined Twitter. Now that you see what data you get with a tweet, you can envision interesting types of analysis that can emerge by analyzing a whole lot of them. Unfortunately, you do not have carte blanche to share the tweets you collect. Twitter restricts publicly releasing datasets according to their API Terms of Service (https://dev.twitter.com/terms/api-terms). This is unfortunately for collaboration when colleagues have collected very unique datasets. However, you can share derivative analysis from tweets, such as content analysis and aggregate statistics. For now, we’re not going to access that cluster (and given that it’s not been setup yet, it’s not possible). Instead we’re going to connect to an old computer I have running out of my living room. Which means be very sympathetic to my bandwidth restrictions. Here is how you connect to it. Download PuTTy at http://www.chiark.greenend.org.uk/~sgtatham/putty/. Save and open it. Use the credential information that I give you in the workshop. Go to Applications -> Utilities -> Terminal and open Terminal. Type ssh <username>@ec2-54-225-7-147.compute-1.amazonaws.com, where <username> is the username I give you. Use the credential information I give you in the workshop. Note: don't type [[email protected] ~]$. This is the command-line identifier that I'm using so you know you're on the command line. Type everything after the $. [[email protected] bin]$ cd ..
First thing’s first — get a text editor. Go to http://www.jedit.org/ and download jEdit. jEdit is a free, open-source text editor written in Java. It has a ton of cool features and makes editing files on remote servers a snap. Which is why we are using it. Once you have downloaded it and installed it, go to Plugins->Plugins Manager in the menu. You should get a screen that looks like this. Click the "Install" tab and find the "FTP" plugin. Select the checkbox and click install. Once it installs, close the window. Now, select Plugin->FTP->Open from Secure FTP Server... from the menu. Type in all your information so looks like the screenshot below. Now, once it loads, navigate to the "hse-twitter/bin" directory like you would with a GUI file manager. Open up streaming.py. This is the file we'll eventually get to editing. However, before that, I need to give a little background on Python. Python is an interpreted script language. This is different from languages like Java or C, which are traditionally compiled into a language that the computer can read directly. Python is different. It reads files like a script -- line-by-line and executing commands in a procedural fashion. Collecting data is pretty straightforward with tweepy. The first thing to do is to create an instance of a tweepy StreamListener to handle the incoming data. The way that I have mine set up is that I start a new file for every 20,000 tweets, tagged with a prefix and a timestamp. I also keep another file open for the list of status IDs that have been deleted, which are handled differently than other tweet data. I call this file slistener.py. You should have a copy of it. Next, we need the script that does the collecting itself. I call this file streaming.py. You can collect on users, keywords, or specific locations defined by bounding boxes. 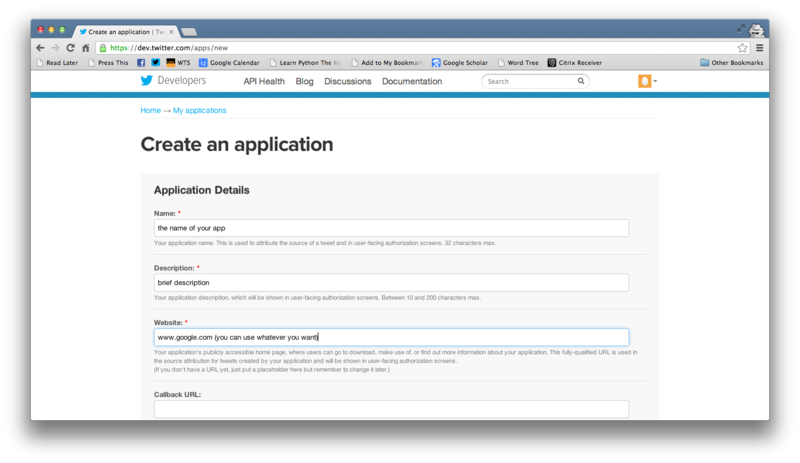 The API documentation has more information on this. For now, let’s just track some popular keywords — "obama" and "egypt" (keywords are case-insensitive). ## TK: Edit the username and password fields to authenticate from Twitter. ## Eventually you'll need to use OAuth. Here's the code for it here. You need to change the username and password variables in the code above for it to work. You can do that by accessing the file through jEdit and making the changes there. Use your personal Twitter username and password, or create one for the workshop and use it there. To stop this script from running, press Ctrl + C.
Note: if we run this all at once we may get an error from Twitter. If you can a 421 error, that is what is probably happening. So only run this for a second and then quit out of it. You can see the data collected by going to the data directory. If you are in bin, you can type cd ../data. Then type ls -l to see something like this. The file that ends with "json" is the Twitter data. If you type "more <filename>" you can see some of the raw JSON. Once we've actually collected some Twitter data, we need to get network data out of it somehow. For the current analysis we are just going to look at mention networks. The way that tweets are structured, we can easily pull out mentions of other users. A potential pitfall of pulling out mentions this way is that retweets are also recorded like this, so we could be measuring both retweets and mentions. However, we can bracket this considering right now. There are ways of filtering out retweets that we can cover in future modules. For now, we will focus on how to create mention networks. To run this, we use a few UNIX commands to tie the output of one UNIX command to be the input of another. First, make sure that you are in the bin directory. Next, we'll use the cat command and the | character to pipe the Twitter data into the Python file. You'll need to replace "../data/test.20130816-004221.json" with the name of the file that tweepy generated for you. You'll probably get a lot of output here. To redirect this to a file, you can use the > character. And voila! Now you have an edgelist that you can give to NodeXL, Gephi, or R. You can connect to the server using a tool like CyberDuck (http://cyberduck.ch/) or WinSCP (http://winscp.net/eng/index.php) to download the file and plug it into your favorite statistical package. This is, of course, a very basic sort of method to gather connections. We can also filter user mentions on whether it is a user mention (e.g. @alexhanna hi!) or a retweet. We can also count how many interactions users have between each other within a given amount of time to quantify tie strength. But this analysis is a basic building block of this kind of analysis. Much of this workshop has been based off of this tutorial, which contains a few more details and displays a network graph surrounding the US presidential election. 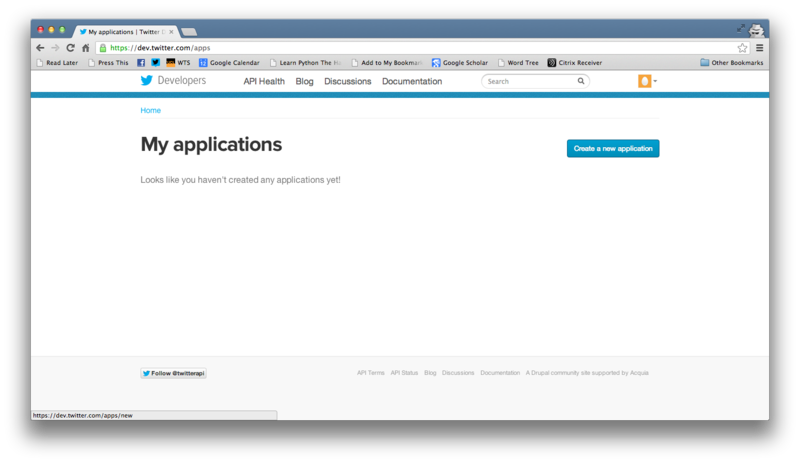 @jsajuria put together this tutorial of how to get OAuth keys for the script above. 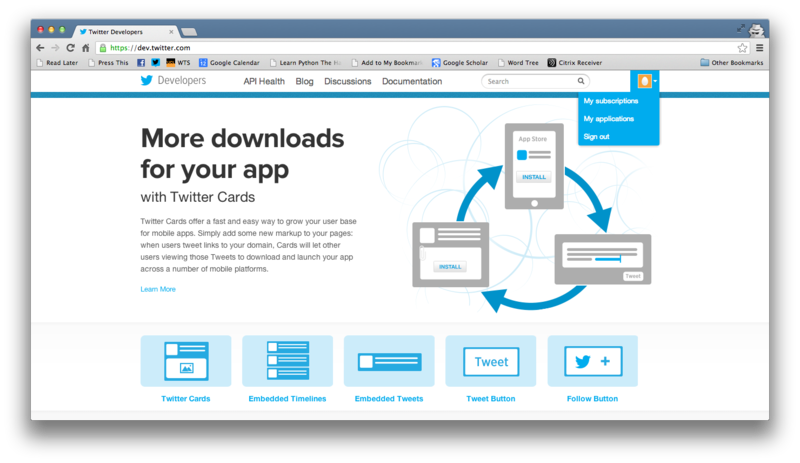 First, go into dev.twitter.com and login using your Twitter account details. You will now activate your account to work as a Twitter developer. Then, click on your Twitter avatar (upper right-hand corner) and a menu will display. Click on "My Applications"
consumer_key        = "YOUR CONSUMER KEY HERE"
consumer_secret     = "YOUR CONSUMER SECRET HERE"
access_token        = "YOUR TOKEN HERE"
access_token_secret = "YOUR TOKEN SECRET HERE"